I love it when people suggest weird music for me. Honestly, that’s what keeps me going. So if you know of any off-kilter artists or bands, then by all means, hit me up. 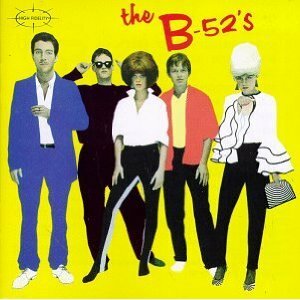 The B-52’s make some weird music. You know that song called Rock Lobster? The one about a lobster that rocks? Of course you do. Well that’s on this record. The strange lyrics and twee-esque instrumentation isn’t unique to that track, though. The band’s eponymous self-titled debut has a lot to like for fans of that song. No, not every tune is a clone of that infamous one, but they all have a similar kitsch-ness to them. Anyway, weird lyrics are what give this band its strange, unconventional, but charming sound. It’s almost as if they’re a predecessor for all the weird indie bands that were to follow in The B-52’s footsteps. Strange has become the standard in today’s indie scene, so it’s interesting to hear strange from when it was actually strange. If it is truly off-kilter that you seek, I can do no better than to suggest The Residents who have been doing off kilter for about 36 years while dressed as eyeballs. Like concept albums? Try their Commercial Album – 40 songs each exactly one minute long. 1. Kid Creole and the Coconuts: Tropical Gangsters (U.S. title Wise Guy) – Squirrel Nut Zippers go dancing in Spanish Harlem and make a concept album that has things in common with Mamma Mia. 2. The Jazz Butcher: Cult of the Basement – Dry absurdist British humor meets upbeat, catchy arrangements. I really want to recommend the excellent 3 disc compilation Rebecca Wants Her Bike Back but I hear you are not a fan of the compilation. I just cannot see you not loving The Jazz Butcher. Okay SE — now you have to listen to Iggy Pop’s duet with the B-52’s Kate Pierson — Candy. Maybe that will help you embrace Iggy. Maybe not. Iggy purists just think the song is a sell out. As for The Residents — Chops is right. Listen to them while reading the Incandenza filmography footnote in Infinite Jest and your head may spin.